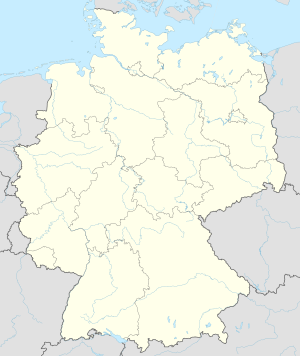 Lucius D. Clay Kaserne (German: Flugplatz Wiesbaden-Erbenheim) (IATA: WIE, ICAO: ETOU) is a military installation of the United States Army within Wiesbaden-Erbenheim, Germany. The installation is named for General Lucius D. Clay. It is the headquarters of United States Army Europe (USAREUR). The land on which the airfield stands was originally the Wiesbaden track for horse races built in 1910. In 1929 it was converted into an airfield and in 1936 the German Luftwaffe took over the base. One unit stationed there was Jagdgruppe 50, a fighter group of Messerschmitt Bf 109s. On 17 August 1943 the unit intercepted American bombers taking part in the ill-fated Regensburg Strike targeting the Messerschmitt factory in Regensburg and the ball bearing plants in Schweinfurt. Alfred Grislawski, a German Luftwaffe fighter ace, took part in that mission. Beginning in September, 1945, the European Air Transport Service operated passenger and cargo service from Wiesbaden daily to London, Munich, Bremen, Vienna and Berlin. From Berlin an EATS plane made weekly flights to Warsaw, Poland. Flights originated from Vienna for Bucharest, Belgrade, Sofia and Budapest. In the Mediterranean area EATS flights connected Udine, Pisa, Rome and Naples. EATS originally was composed of left-over wartime troop carrier squadrons, glider and fighter pilots, B-17 crewmen and other available personnel. In addition to regular flights which service the Army of Occupation, EATS also operated special flights such as providing transportation for diplomatic officials, evacuating sick or wounded, performing mercy flights, aiding the Graves Registration Service in returning the remains of American soldiers and rushing supplies to needy areas. In 1948 the facility served as a hub supporting the Berlin Airlift with around-the-clock flights from Wiesbaden to Tempelhof Airport. Airmen from Wiesbaden distinguished themselves in support of "Operation Vittles". C-47s and C-54 "Skymasters" of the 60th Troop Carrier Group flew missions daily from Wiesbaden to Tempelhof in the beleaguered city of Berlin. During one day's operations more than 80 tons of food and supplies were airlifted from Wiesbaden. The streets on Wiesbaden Air Base were named after servicemen who gave their lives during the Berlin Airlift. On 4 July 1956 a U-2A stationed in Wiesbaden flew over both Moscow and Leningrad as part of Operation Overflight, missions to spy on Soviet military bases. This was the first flight by a U-2 over the USSR. It was flown by USAF pilot Hervey Stockman, and the aircraft is now in the National Air and Space Museum in Washington, D.C. In 1973 HQ USAFE was relocated to Ramstein Air Base near Kaiserslautern. The Air Force moved most personnel out of Wiesbaden in 1975 as part of Operation Creek Swap, in which most Army facilities in Kaiserslautern were turned over to the Air Force, in exchange for the facilities at Wiesbaden. The 4th Brigade, 4th Infantry Division, was stationed at Wiesbaden in 1976 as part of "Brigade 76" until it was replaced by the 3rd Corps Support Command and 12th Aviation Brigade in the mid-1980s. Strategically, in the mid-1980s, the base facilitated flights of the F-117 "Stealth Fighter." Although not officially acknowledged by the U.S. Air Force until 1988, the F-117 became operational in 1983. The Wiesbaden airbase would "go dark", turning off all airfield and perimeter lights, whenever "stealth" flights were landing or taking off. From 1975 to 1993 Wiesbaden was a joint Army/Air Force community with a service-wide reputation for excellence that was enhanced by the strong bonds that developed between these organizations. In 1993, Wiesbaden Air Base was officially renamed Wiesbaden Army Air Field. Until summer 2011, Wiesbaden AAF was home to the headquarters of 1st Armored Division and a number of subordinate units. As American forces draw down in Europe, current plans call for Wiesbaden to remain one of six geographic hubs for U.S. forces in Europe. After the closure of US facilities in Frankfurt, Germany, the headquarters of American Forces Network (AFN) was moved to Mannheim. AFN opened a small regional studio, AFN Hessen, on Wiesbaden AAF to serve the American troops in and around Wiesbaden. Lindsey Air Station, an installation on the opposite side of Wiesbaden from the air base, was established as an Army Air Force installation on 13 November 1946, having previously been a German Army facility named Gersdorff Kaserne. Lindsey achieved its greatest prominence between December 1953 and 14 March 1973 when it was the host base for Headquarters, USAFE. After the transfer of Wiesbaden Air Base to the Army in 1976, Lindsey AS provided support for various Air Force units in the Wiesbaden area until it was returned in 1993 to the Federal Republic of Germany and renamed Europaviertel. The buildings at Lindsey now house certain offices of the German Federal Investigation Bureau Bundeskriminalamt (BKA), the State Police of Hessen, new private housing and a folk high school. The sports field and gym are now the home of the Wiesbaden Phantoms. Clay Kaserne is the new U.S. Army headquarters in Europe. The U.S. Army headquarters in Heidelberg and Mannheim have relocated to Wiesbaden. Because of this decision Clay Kaserne is growing with many new building projects and modernizations since 2009. On June 14, 2012, Wiesbaden Army Airfield was renamed "Lucius D. Clay Kaserne" after General Lucius D. Clay. Clay was the former U.S. military governor of the Germany and architect of the rebuilding of Germany after World War II that led to the Marshall Plan. Clay instituted Operation Vittles from Wiesbaden Army Airfield in 1948, retiring only after the Soviets lifted their blockade of Berlin. Prior to this renaming, "Lucius D. Clay Kaserne" was the name of a U.S. Army facility in then-West Germany, near the community of Garlstedt in Osterholz-Scharmbeck. The installation still named Clay Kaserne had been the home of the 2nd Armored Division (Forward) and is now the home of the Bundeswehr's logistics school. ^ "Colonel Hervey Stockman, CIA u-2 Pilot, POW". Roadrunnersinternationale.com. Retrieved May 21, 2017. ^ Powers, Francis (1960). Operation Overflight: A Memoir of the U-2 Incident. Potomac Books, Inc. p. 29,34,94. ISBN 9781574884227. ^ "Agency U-2 Pilots: Hervey Stockman — Central Intelligence Agency". Cia.gov. Retrieved May 21, 2017. ^ "Aboard the Enterprise, landing gently in the dark of night - News". Stripes. Retrieved May 21, 2017. ^ "R-Intelligence Technical Support Services". US ARMY. February 1, 2012. Retrieved February 1, 2012. This page was last edited on 26 January 2019, at 20:31 (UTC).